Annie Lilwall’s father, Sid Dykes, far left, was a member of Clehonger and Allensmore Home Guard during the last war. He was in the Reserved Occupation, working as a farm labourer for Honey’s at Clehonger Court. 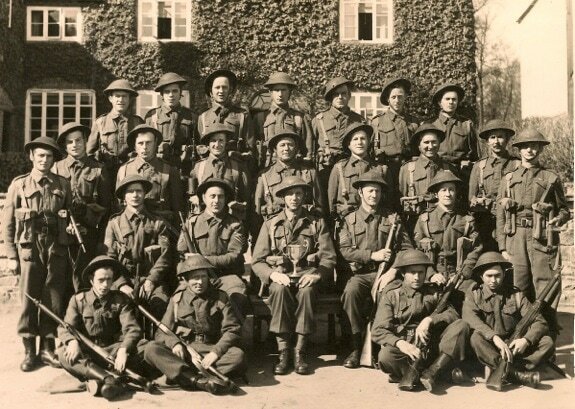 Do you have wartime photos and memories to share with BHG? What do you remember? Concerned about the diminishing pool of people who can still recall the last war, Naomi Bell starts the memory ball rolling with her own recollections. Did you, or your father or other relative, serve in the forces? Or how about serving in the WVS, or as a landgirl or in the Home Guard? Were you an evacuee or did your family host evacuees? How about rationing and wartime recipes? I’ll start you off with a recipe, Beanie Pie. You need mashed potato, a tin each of baked beans and corned beef. Mash the beans and corned beef together top with the potato and heat through in the oven for about 20 minutes. You might even like to try it. It’s surprisingly appetising! Does anyone else have recollections of other wartime dishes? We’d love you to search your memories and recipe books! I was very fortunate as a child inWW2 to live in an area largely untouched by enemy action. We arrived in a village just outside Ludlow when the school where my father taught was evacuated to Ludlow. My father served in the Home Guard as having served in WW1 he was too old for active service in WW2. My own memories of the war are, happily, of a childhood hardly affected by the horrors of the blitz. We could hear the engines of enemy bombers going up the river valley to Liverpool nightly – occasionally a “leftover” bomb was dropped by pilots returning to base. There must have been a POW camp nearby as we saw German POWs working in the fields. I remember gas mask drill. We had to take our gas masks to school and from time to time practise putting them on. My sister, 2 years younger than me had a Mickey Mouse gas mask which I envied, but mine was the standard issue. The school was overfull as our village was a reception area for evacuees – some, I think, came from Sheffield. We used to knit “comforts” for servicemen – at 7 years old I knitted a khaki scarf! I can never remember going hungry. As far as I was concerned the government’s plan to keep the nation adequately fed worked well. I can vouch for Corporal Jones of Dad’s Army fame being very true to life in his role as a butcher. Offal, though limited in supply, was not on ration and butchers really did keep it under the counter as a sort of unofficial rationing system! Country dwellers were fortunate in that they could grow their own vegetables and fruit was also available both from gardens and orchards and also from hedgerows. School milk at a halfpenny a day and free cod liver oil and orange juice helped keep us healthy. 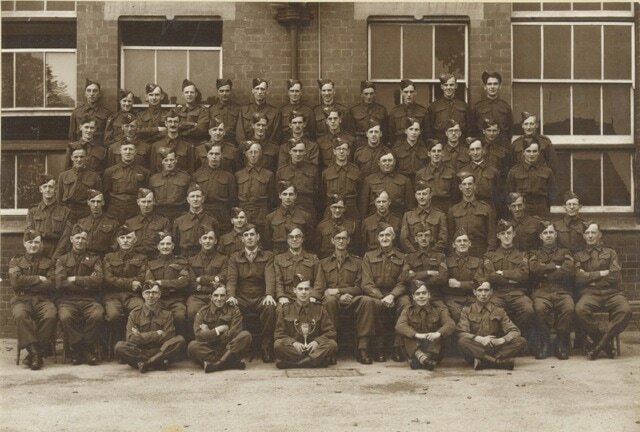 Bill Young, centre back row, in the city Home Guard, A Company, 3rd battalion. Photo loaned by his daughter Ann Johnstone.